Japan in Architecture: Genealogies of Its Transformation is a survey of the history of Japanese architecture. 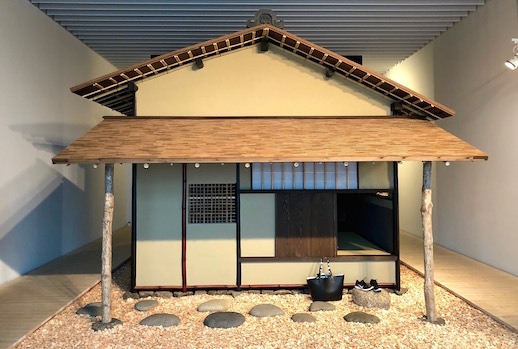 On view at Mori Art Museum until September 25th, this exhibition attempts to explore and find significance behind the question “What is Japanese architecture?” It presents over 400 displays including video and photos, but mostly models of varying scales representing over a hundred buildings from ancient times through today. There is even a video installation on the lineage of Japanese architecture by media art group Rhizomatiks and a reading salon with famous furniture pieces by Japanese designers. These highlights make for a solid show, yet a broad focus and unwieldy themes, coupled with the sheer number of works, leads to an experience that is incredibly dense, confusing, and ultimately exhausting. The problem with the exhibition is volume. The museum has assembled six curators led by the architectural historian and experimental architect Terunobu Fujimori; between them, they have produced nine concepts which define Japanese architecture: Possibilities of Wood, Transcendent Aesthetics, Roof of Tranquility, Crafts as an Architecture, Linked Spaces, Hybrid Architecture, Forms of Living Together, Japan Discovered, and Living with Nature. Each of these concepts could be an exhibition onto itself. Some themes are more concrete than others, and room after room is jam-packed floor to ceiling with media out of chronological order and devoid of context, making the show both heavy and bewildering. As the curators have focused on breadth rather than depth, the encyclopaedic volume of work shown means that each visitor will likely have at least one “wow” or “that is interesting” moment. 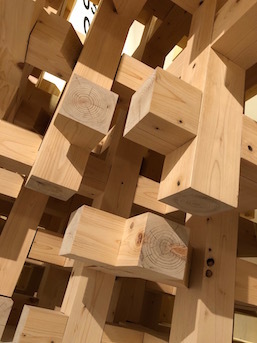 A recreation at the entry of Atsushi Kitagawara’s Kigumi Infinity, with its strong fragrance of hinoki Japanese cypress, speaks volumes on the beauty of Japanese architectural craftsmanship and attention to detail. Also, models of Izumo Taisha Grand Shrine and a computer-generated recreation of Frank Lloyd Wright’s now-demolished Imperial Palace hotel provide fascinating visual references for buildings that presently exist only in history books. We must remember, however, that architecture is steeped in and is a product of its context. It is experiential, and is as such difficult to recreate. Sadly, in this exhibition a lack of depth means that most pieces become curious sculptures divorced of their significance. 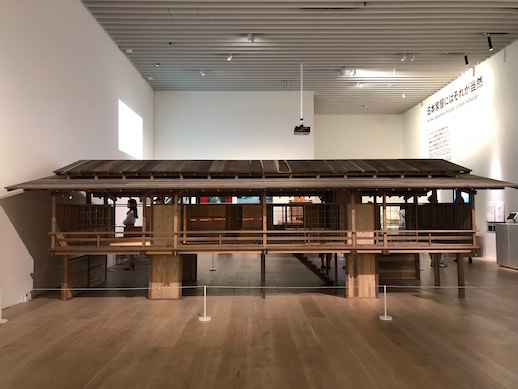 The two largest displays, a recreation of tea master Sen no Rikyu’s 16th century teahouse Tai-an and a ⅓ scale model of Kenzo Tange’s home, are so removed from their original contexts that they take on what must be completely different feels from the actual buildings themselves. Though it is an outstanding feeling to be sitting in a replica of a 16th century teahouse overlooking the Tokyo skyline from the 53rd floor of Mori Tower, there is no way that this experience could be anything similar to the introspective, meditative state that Sen no Rikyu surely envisioned when he designed the building. This becomes glaring when you realize that the building’s original purpose was for the zen art of the tea ceremony. Kenzo Tange’s A House presented as a smaller model, meanwhile, seems like a wasted effort. Built at an odd scale with an unfaithful materiality that casts a historical pall over the real building, the replica makes what is actually a light and bright architectural piece designed with its landscape in mind feel antiquated, heavy, and dark. Overall, though, the presentation doesn’t offer much for the layperson, in sharp contrast to the Leandro Erlich exhibition that inhabited the same halls earlier this year. While significant in being the 15th anniversary show for the museum, Japan in Architecture is more characteristic of a permanent exhibition at the older museums in Ueno than the fun yet contemplative contemporary art we have come to expect from the Mori Art Museum.